The human voice is one of the most diverse signals ever encountered by engineers because it contains such large variations in level and harmonic structure. Getting the desired vocal sound can sometimes prove difficult. Setting the E.Q. to give the vocal sufficient ‘definition’ and ‘cut’ in the mix can cause large sibilant peaks which often lead to severe distortion. The MX50Pro ‘Vocal’ De-Esser solves these problems quickly and efficiently by reducing the level of the sibilant sounds whilst leaving the remainder of the signal unchanged. The MX50 is a flexible, simple to set up dual De-Esser designed to fulfill the needs of the Recording Studio, Broadcast, Theatre and Live Sound Industries. Its classic application is to overcome the problems that can arise when sibilant sounds (S’s and T’s) are over-emphasized by the human voice, with such other applications as ‘smoothing’ a stereo mix, reducing string noise on acoustic guitars or breath noise on flutes, even refining cymbal and hi-hat sounds. Processing is achieved by adjusting just two control parameters, Frequency and De-Ess. The fully variable Frequency control operates from 800Hz to 8KHz encompassing the full sibilant range, including ‘hard’ sounding harmonics and other side-effects which can be generated when treble frequencies are boosted or enhanced. This is followed by the variable De-Ess which acts as a ‘more’ control giving up to 20dB of gain reduction at the selected frequency. Air function: As sibilance rarely occurs above 10KHz this feature adds back high frequency ‘gloss’ in excess of 12KHz preserving upper harmonics and increasing the transparency of operation. Bypass: The Bypass position routes the input signal to the output with no processing. 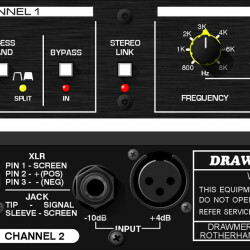 These switches are independent of any linking and will only bypass their respective channel. Status LED illuminates when engaged.